The art of DJing is now in the digital age, and the next generation of DJ mixers needs to keep pace with the CDJ revolution. Our DJM-2000 truly does that. The brand new DJM-2000 is our most powerful performance mixer and is the perfect match for the new industry-standard CDJ-2000 digital decks. 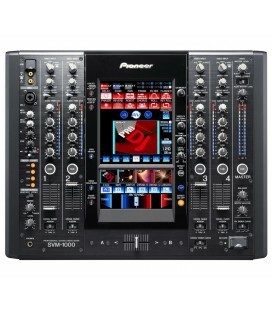 With an innovative touch screen and arsenal of remixing FX, the DJM-2000 forms the ultimate club mixer. No less than six individual effects processors lay the foundation for hundreds of music manipulation combinations, so a DJ can always create their own unique sound. The new DJM-2000 takes advanced features – thought only possible in software – and reinvents them in the physical world. 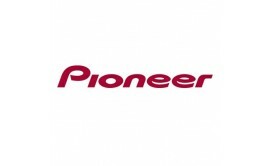 Its intuitive layout will feel natural to existing Pioneer DJM users allowing creativity to flow whilst keeping its technical complexity under the skin. 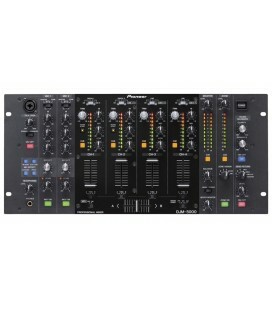 The top of the range new mixer has been developed with the help of a number of international DJs. James Zabiela, Roger Sanchez, Eddie Halliwell, Tom Middleton, the Swedish House Mafia, Paul Woolford, John ‘00’ Fleming and Radio 1’s hard dance darling Kutski have all tested out the DJM-2000 at various stages of development – giving it the ultimate stamp of approval. 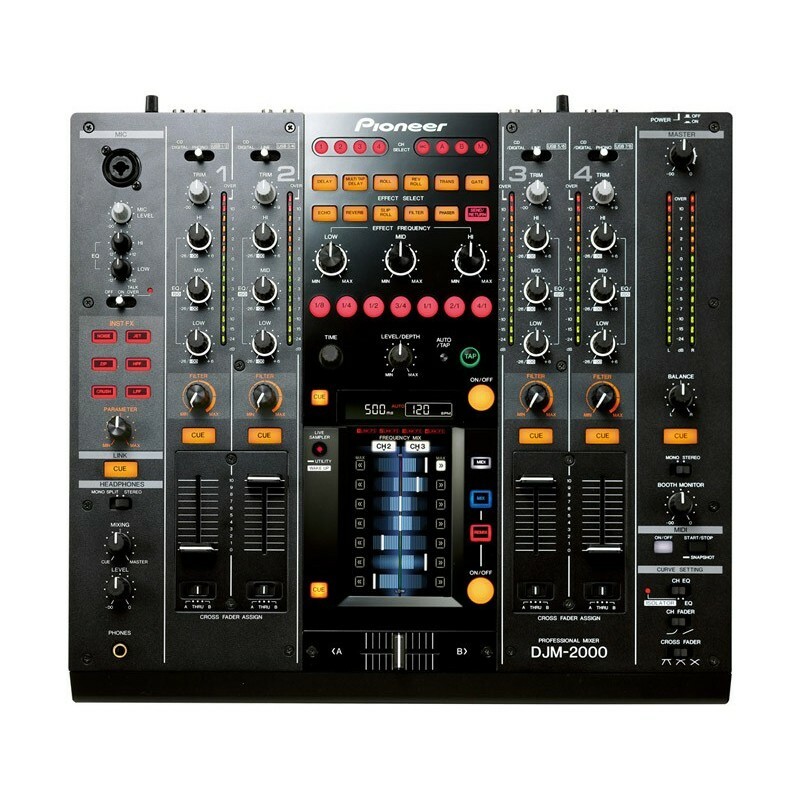 The DJM-2000 mixer, in conjunction with the CDJ-2000, offers a new performance orientated platform for the increasingly futuristic artform as the next ten years unfold. Taking the best DNA from our other top end mixers and with other major enhancements, the DJM-2000 represents a new approach to mixing never seen before. It has effectively built in the technology of the EFX-1000, removing the need for an external effects unit along with touch screen technology from the SVM-1000. 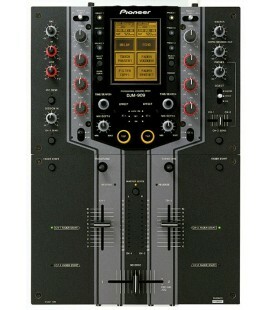 The DJM-2000 is the world’s most complete and creative DJ mixer. It’s the essential mixer to get the most from the new CDJ-2000, and offers amazing new creative possibilities. The ProDJ Link function makes it easy to switch over from one DJ to the next. By connecting up to 4 CDJ-2000s / CDJ-900s via LAN cable into the mixer and two laptops running rekordbox via USB In, the DJs can share music libraries across all decks. 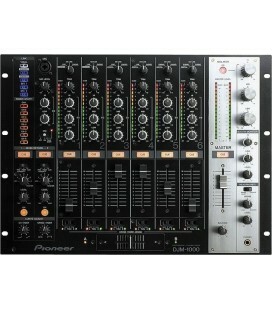 The DJM-2000 also excels with its functionality. 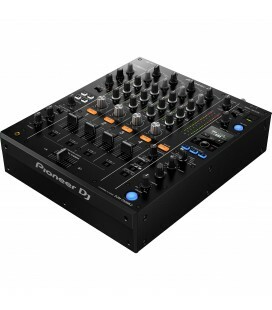 While inheriting the basic layout of their club standard DJM series, we have come up with a larger interface positioned perfectly in the middle of the mixer. The very first 5.8” large LCD multi-touch panel allows the DJ to use touch panel effects whilst checking them visually. It also comes with beat effect and INST FX functions, which means the DJ can alter the sound spontaneously without having to connect to multiple devices – allowing for a more flexible and unique performance. 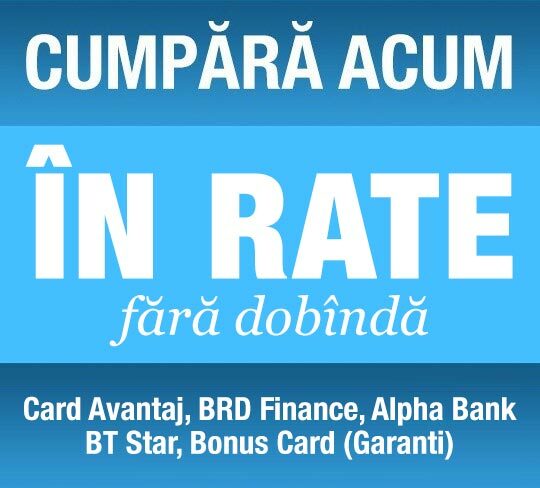 Another highlight of the INST effects is that they are available individually on each of the four channels. They offer more accurate control of filters, and the Hi Mid and Low EQ on each channel can be switched to make them Isolators – giving the DJ more choice. 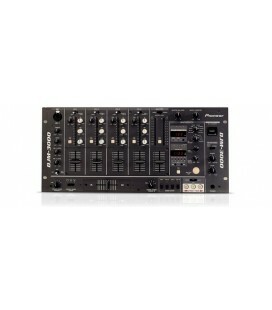 The CDJ-2000 and CDJ-900’s HID control of DJ software allows virtual decks to be manipulated without time-code vinyl, and now the DJM-2000 further simplifies connectivity directly to your Mac or PC by having a soundcard built in. Just as clubs and professional DJs are upgrading to CDJ-2000s, the new DJM-2000 completes the setup, offering a new reliable platform for creative DJ mixing at the highest level. We have laid out the interface in the centre of the mixer to give intuitive performance. DJs can add arrangements to music by not just rotary control, but via Tap and the new Trace method within the three Effect sections. Plus, the three Effect sections can be used in combination, giving the DJ all the more scope for original arrangements. Our industry first 5.8-inch large LCD multi-touch panel display means the DJ can see and hear the result of effects, while easily and intuitively operating the mixer like no other before. We have added three kinds of performance modes: the Frequency Mix enables a more precise music mix, the Sidechain Remix has seven kinds of dynamic effects, and the four types of MIDI mode allow the DJ to use a computer - making every DJing scenario possible. The unique new EQ cross fader takes frequency mixing to a whole new level. The new DJM-2000 is also equipped with an evolved Beat Effect, a highly acclaimed function of the DJM series. Effect Frequency allows the DJ to control the level of effects to add to each frequency band, so an echo can be added just to the vocals, or the hi-hat rhythm can be doubled, providing flexibility to perform like never before. Physical buttons have also been added for selecting effects and beats, making it possible to jump between different measures instantly. The DJM-2000 also boasts six kinds of effects (Noise, HPF, LPF, JET, ZIP & Crush), with an HP and LP Filter knob for each channel. The Parameter knob allows for fine-tuning of each effect. Innovative effects such as Noise (a white noise generator) when combined with new beat effects such as Gate, Slip Roll or Multi-Tap instantly unveil powerful remixing possibilities. 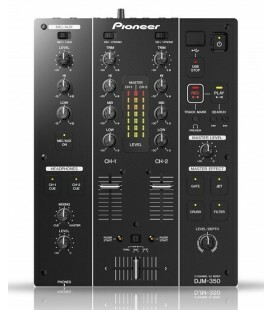 DJ players (CDJ-2000 & CDJ-900) that are compatible with ProDJ LINK and a computer with rekordbox installed can be connected to the mixer via a LAN cable which enables music to be shared across all 4 players from a single source. 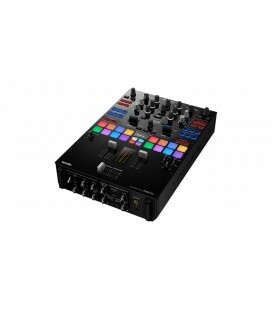 Storage: the music files and control data saved on an SD card or USB storage device can be shared and played on up to four CDJ-2000 or CDJ-900 players via this mixer. rekordbox link: the music files and control data of rekordbox can be read and played on CDJ-2000 or CDJ-900 players via this mixer. Live Sampler: sound input from MIC or sound output from the Master can be recorded to this mixer and played on a CDJ-2000 or CDJ-900. Words recorded from the MIC can be immediately used for scratching or for other new performances on the linked CDJ’s. Link Monitor: the music files in rekordbox can be monitored on headphones. This allows the DJ to check the song before playing it on a player, thus making it a smooth-flow for selecting and playing a song. Status Information: The status of each connected channel (On-air status, channel number, etc.) is sent to the connected CDJ-2000 or CDJ-900. The colour of the JOG wheel light changes for the current on-air channel, allowing the current status to be checked at a glance during DJ play. Convenient for club or studio as it is 19-inch rack mount ready (meets EIA standards) when connected to separate rack ears (not included). 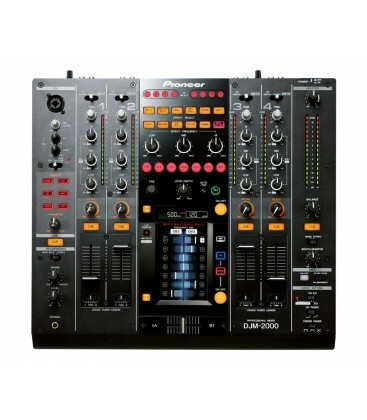 The mixer is equipped with a USB Audio Interface, which allows the audio signal of music playing on a computer to be inputted to the DJM-2000 via a USB connection with the computer. This makes it possible to use a computer, even without an external sound card. From one computer up to a maximum of four sources of audio signal can be assigned to each channel. It is also possible to output the master output to the computer. This makes it extremely convenient to record the mixed audio. The DJM-2000 uses a balanced output amp and its completely discrete structure allows the sound quality in each bandwidth to be adjusted. We pursued the ideal club sound by painstakingly creating a sound down to the very details of how sound resonates. By using a high fidelity, balanced hybrid op-amp and a perfectly balanced output circuit in the analogue processing, they achieved a reduction in noise with a dynamic range of 107dB with 0.004%THD, providing a clear, powerful sound. Equipped with a switching 3-band EQ and 3-band Isolator on each channel the EQ provides control of +6dB to -26dB & the Isolator gives +6dB to -∞dB.